Living on a budget when you're gluten free is not easy! Here's how I save money and make fast and frugal meals. Instead of going out for takeout I made this Broccoli Beef from leftover Roast Beef we cooked a few days ago. The first night we had a wonderful Roast Beef dinner, then I made Beef Hash the second night and now this is the third dinner we've made from that roast. It was a 4 pound roast at $3.75 a pound. So each dinner has been only $5.00 in meat! Then I got lucky and found these bags of veggies buy one get one free. They worked great for the stir fry tonight and saved me all that chopping! Another favorite trick is mixing Quinoa into our rice in the rice cooker. Quinoa is very expensive but I found Bob's Redmill at Big Lots for $6.95 the other day and it lasts forever when you use it this way. 10 minutes after you start the rice, heat the oil in a large Wok or heavy fry pan to medium high. Stir fry onion for a minute. Add vegetables and stir fry for 4 minutes. Add garlic and stir. 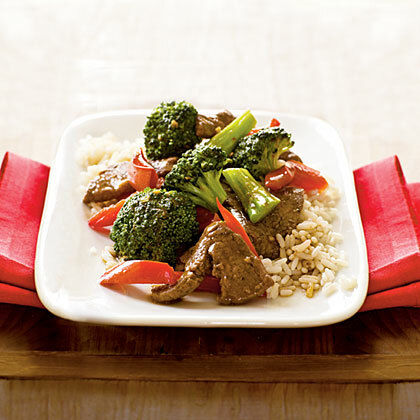 Add cooked roast beef , stir fry for 2 minutes to brown. Gently scraping the bottom as you stir fry. Add to pan and stir fry just until thickened, adding water/stock if it becomes too thick. Fantastic stir fry!. I really love broccoli because it has a high amount of potassium, which can help to maintain our healthy nervous system and it also has a magnesium and calcium that help regulate blood pressure. I will cook this for my family so they grow to be more healthy. Thank you for sharing this recipe with us. non organic veggies will have monsanto pesticides. I'm not perfect though, as sometimes i eat non organic.Just thought i would tell you.